and giggling my silly little head off. Boy, oh, boy, is this gonna be fun! 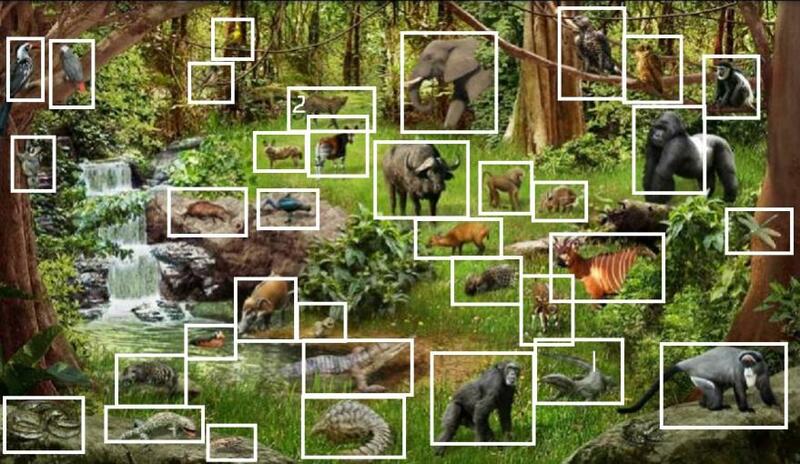 In the picture below, there are 'critters'.... lots of 'critters'. Can YOU find all of them? Can YOU name them? The FIRST person who can NAME all the 'critters' will receive a 'something' from my Home & Garden Collection (plus the piece of jewelry from the last game that Andries could not accept). Answers will be posted and Winner announced Friday PM next (my time). Can I draw a big circle around the whole picture and list all the critters in it? Changed.... no need to circle, just NAME the 'critters'. And about three or four others that I could not see clearly or just don't know! Dunno what #2 is (wasn't on answer sheet) and #1 methinks is a hyena (also not on answer sheet). ...and the Winner is: zerohour. Congrats! Runner-Up (Honorable Mention): Cali. Congrats! Since only the two of you 'braved' the 'wild' to find the critters, you both win. Please send shipping info via PM. Number 1 looks like a leguaan (monitor lizard). Number two looks like a leopard (cheetahs have dark "eye make up" running from the inner corner of the eye down the nose/snout). Cali... if you change your mind, just send info via PM. My grandbabies walk several blocks to school and with the 'crazies' out there, they each will have one when the school year starts. How do they work Ruthie? ja ja ja always with the jokes, I just want to know how long I have before the police arrive. Andries wants one for his beers Ruthie, he doesn't like sharing without knowing he is sharing. hey those were the best 4 years of my life man. Lift the small flap on either the right shoulder strap or on the front of the bag (varies) and pull the activation cord. The pin will disengage from the switch instantaneously and activate the alarm in a split second. Then, to deactivate, reinsert the pin. The backpack has an adjustable chest strap that secures the backpack to fit the child making it awfully hard for the big, bad 'creep-o' to remove the backpack. This side, we have 'bullies' who like to get a smaller or weaker child isolated (bathroom, stairwell, etc) and 'pound the crap' out of them. Some are even attacked on the way home from school by those 'bullies'. Activating will send out an horribly loud alarm and lights will flash... (lights kinda like the revolving, bright lights on a cop car).